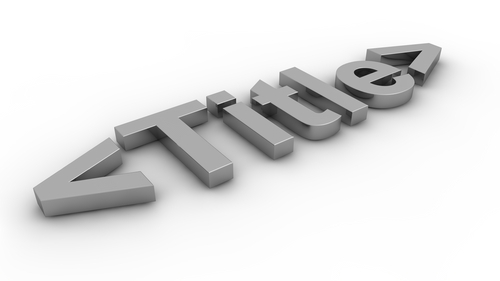 From author and former agent Nathan Bransford: How Did You Choose Your Title? When I first conceived my current work-in-progress, it had a very obvious title. This is often the problem. Writers choose the most obvious title for their work, without putting in the extra time to make sure it’s the most appropriate title as well. At first I remained joined to my original title. It was, after all, obvious to me that this novel should have this title. But then I asked myself something: I’d spent hours laboring over every word in the manuscript, but had I devoted a similar level of attention to the title? The answer was simple: no, I hadn’t. So I embarked a project very similar to the one Rachelle describes in her post. Though I hadn’t yet read it at that point, so I can take at least a little credit for coming up with my process on my own. First, I sat down with a blank piece of paper and a copy of my manuscript. I then started, without judgment or hesitation, to write down all the significant words from or relating to my project I could think of. Brainstorming. I leafed through the manuscript when I got stuck for more. I didn’t spend any brain cells at that point evaluating if the words I was writing down might work in a title. I just wrote them down. All of them. Next, on a new sheet of paper, I separated the words into columns: nouns, verbs and adjectives. Then I went through and circled the most powerful ones. Please note: I circled not the most unique words, but the most powerful words. I think this is an important distinction, because there’s nothing worse than a title containing words you have to look up to understand. The words should be (relatively) common but moving, emotional…powerful. Of course, there is no one-size-fits-all method to this. Perhaps your novel deals with a subject matter that calls for a really unique word to be used in the title that people will have to look up the meaning of. Maybe, in your case, such a word might generate additional interest in the work. But, generally speaking, I would suggest containing yourself to powerful, interesting words that most people already understand the meaning of. Once you have this list of words, start combining them in different ways. As Rachelle suggests, shorter titles are sometimes easier to remember, so check and see if any one word or two word combinations would work. If not, start working with longer combinations. Don’t be afraid to include words like “of,” “and” and “the” as connectors for the other, more interesting words if it makes sense for you. These words are probably not on your “most powerful” list but that doesn’t mean you might not need them. Don’t grow concerned if this process takes you some time. It’s deserving of as much of your attention as you gave the rest of your project. In fact, you might consider doing it in stages: coming up with your list of words one day and letting them sit until a day or two later to start the combining part of the exercise. Your subconscious can work wonders if you let it. And a good title might just attract an agent, a publisher and…eventually…readers! EDIT TO ADD: I should have said above in the portion about choosing the most “powerful” words that a big determinant to this can be those words that have a double meaning, especially if it’s a double meaning as it pertains in particular to the plot or themes of your novel.